Mark your calendars Phoenix Comicon is June 2nd-5th at the Phoenix Convention Center. We will be in Artist Alley again this year at table AA600. 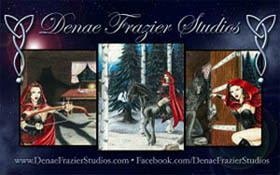 We’ll be selling Denae’s Art Prints, Sketch Art Cards, Art Buttons and her Original art! Make sure you come and say “Hi”! We’ll see you all there!! This entry was posted in appearances, art, events, news and tagged Art, Art Buttons, Art Prints, Artist Sketch Cards, Buttons, Comics, Original Art, Phoenix Comicon, Phoenix Convention Center, PHXCC, Sketch Cards. Bookmark the permalink. Trackbacks are closed, but you can post a comment.